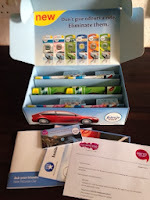 This week I received my Febreze Car campaign pack from Supersavvyme. 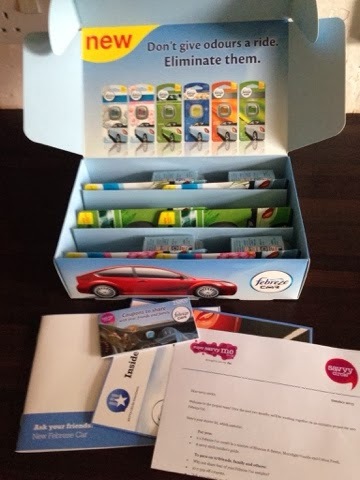 The box arrived filled with samples, a coupon booklet and an information booklet. The samples came in scents - Cotton, Blossom & Breeze and New Zealand. I have already picked two of the samples for personal use and experience ; one for my hubby's car and one for mine, and the rest I will give to friends and family to try out. I went for the Blossom scent, which is absolutely gorgeous. It is a pleasant smell that is not overpowering - there is nothing worse than being in a car, with an overpowering scent. Hubby went for the Cotton scent; he said it smells like sheets that just came out of the wash! - but he was pleased with it and how effective it is. 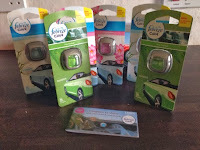 Febreze Car is the newest addition to the Febreze family, it is a small and discreet air freshener that clips on to the air vent in your car (easy-peasy). 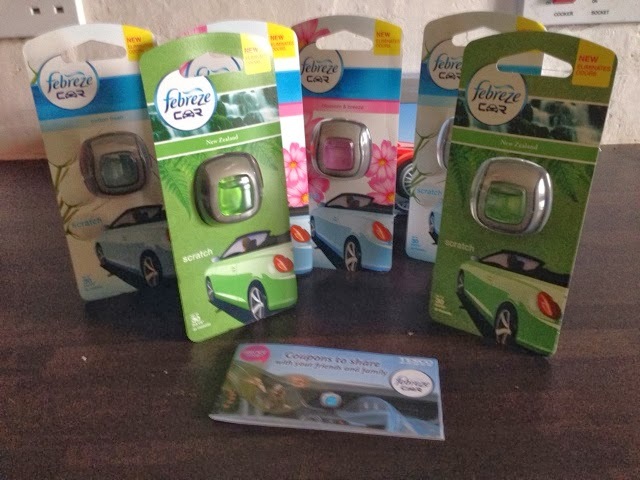 It works in conjunction with your air vent to release a pleasant fragrance throughout the car, and with a new cyclodrextrin technology that zaps away any pesky smells, you can reap the benefit of a fresh smelling trip in your car. In addition It has a dial with three different levels, which you can adjust the level of fragrance to suit your needs. Being the Febreze brand, it does what you expect, by eliminating bad odours and offers a fresh scenario for up to 30 days. These can be brought in most supermarkets.